Chris Randall, Harry Longman, Ollie Pitt, James Cartwright, Levi Smith, Dan Scarlett, Colin White, John Mallard ©, Callum Hughes, Lewis Hewitt, Adam Patterson. the subs bench was Mack Bermingham, Carl Williams, Kalim Ahmed and Brandon Blair. Wraysbury started the game well, looking to settle into the game faster than they have been recently and for the first 15 minutes looked the side most likely to break the deadlock. The Stags came close through a number of set pieces without really testing the Slough keeper. However, it was Slough who scored first, winning a corner which was whipped in and powered home through the Slough Captain. This seemed to rattle Wraysbury who couldn’t re establish the early passing play, and Slough should have doubled their lead when the striker was through one on one with Randall diving well at his feet to save. Wraysbury did draw level from a superb long throw from Striker Patterson, which was met well by Hughes and into the top corner. Slough however hit back straight away with a throw of their own, which Wraysbury failed to deal with, before being turned in to re take the lead. The score at half time was 2 – 1. This unfortunately for the stags was how the scoring would remain. With Slough content to sit deep and defend for their lead in the 2nd half, challenging Wraysbury to break them down. Neither side really tested either goal in the 2nd period, this was despite Wraysbury having Attacking midfielder Mack Bermingham in goal for most of the 2nd half with Randall having been replaced with a Rib injury. 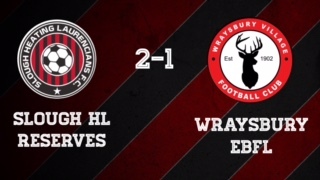 Full time Slough HL res 2 – 1 Wraysbury.